Are you the next Pedro E. Guerrero? Share your photos of architecture, design and artists at work and tag them using #PedroPBS on Instagram. Our favorites will be featured on the American Masters site starting in September. For inspiration, see our gallery of Pedro E. Guerrero’s photography. Guerrero collaborated with three of the most iconic American artists of the 20th century — architect Frank Lloyd Wright and sculptors Alexander Calder and Louise Nevelson. American Masters — Pedro E. Guerrero: A Photographer’s Journey premieres Friday, September 18 at 9 p.m. on PBS (check local listings) during National Hispanic Heritage Month. 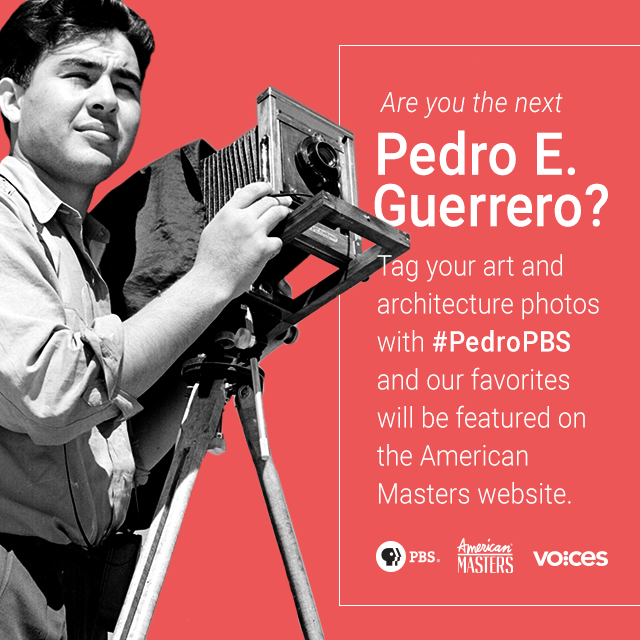 For more information visit: http://www.pbs.org/wnet/americanmasters/uncategorized/pedro-e-guerrero/4019/.